Makkah – The International Conference for Intellectual Trends between Freedom of Expression and Sharia Law asked Muslims to respect the link between religion and co-existence. It also criminalized spreading sectarianism. 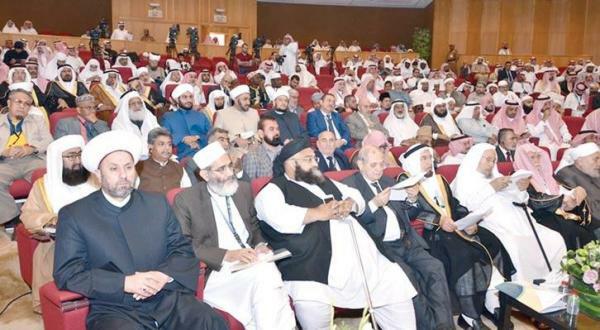 The conference, which was held in Makkah and organized by the Islamic Fiqh Council of the Muslim World League (MWL), concluded the conference by issuing a closing statement of 11 articles valuing the Custodian of the Two Holy Mosques speech and considering it a significant document for the conference. The conference urged the Council in its closing statement to prepare a project on Sharia laws and regulations in contemporary intellectual trends and review it in the next meeting to be considered as a guideline for Islamic organizations around the world. The statement also called on Muslims around the world to support and encourage the unity of Islam by acting according to the real Islamic values. These real values, which we learned from Prophet Muhammad, taught us that there are no different kinds of Islam and all Muslims are equals. The conference stressed that Muslims should not be weakened by minor differences. It also reiterated the importance of standing against media outlets that create and promote hatred and strife between Muslims themselves and with other religions. In addition, the conference stated that sect or Fiqh schools are part of Islam but are not a substitute for the uniting religion. It added that it is unacceptable to argue with scholars who are committed to the righteous path of the Prophet. The statement warned scholars to be taken by appearances of misbehaviors, and urged them to consider the goodwill of others before judging. It added that convictions can’t be forced but rather persuaded through containment and dialogue. Countering terrorism and combating extremism were of the most important items confirmed in the closing statement of the international conference. Terrorism and extremism were likened to an “infectious disease” that is fueled by ignorance and absence of the true Islamic beliefs which terrorist and extremist individuals and groups exploit to pass on their “poisons”. The conference also praised the respect Islamic communities receive in non-Islamic countries given that the laws and cultures of those countries protect freedom of religion or belief. It urged Muslims to respect all laws, asking those who can’t conform to leave the countries without violating rules or tarnishing Islam.